When it comes to exceptional power and performance, especially when you’re on the road, at work, and at play, the 2019 Ford F-150 is a vehicle that delivers! Its packed full of amazing features and systems, pushing power to the next level and making it one of the best trucks on the market! These features make the new Ford F-150 the embodiment of Ford’s slogan, built tough! However, despite all these things, the new 2019 Ford F-150 isn’t without its competition. The new 2019 RAM 1500 is strong, packed full of great features, and a tough competitor for the new Ford F-150 to beat. Picking between these two vehicles can be difficult, especially if you’re not an expert in terms of vehicles and their features. Thankfully, we at Fairley & Stevens Ford are experts in all things vehicles, and we know a thing or two about comparing two vehicles in order to find the best deal! Continue reading to learn more! 13,200 lbs. Maximum Towing Capacity 12,750 lbs. As seen with the table above, the 2019 Ford F-150 and the 2019 RAM 1500 are both great vehicles, offering amazing features for you to enjoy across the board! However, between these two great vehicles, the new 2019 Ford F-150 is the clear winner. It might have a smaller displacement in terms of its engine, but it certainly makes up for it with maximum towing power when compared to the 2019 RAM 1500. 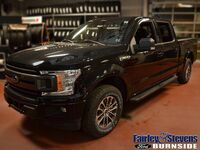 The new 2019 Ford F-150 also has a lower starting MSRP than the new 2019 RAM 1500, as well as more body styles for you to enjoy! Overall, these many features and systems make the new 2019 Ford F-150 the better deal between these two trucks! Contact us at Fairley & Stevens Ford today to learn more!